As the 7-seeded Nets vie for their first postseason berth since 2015, Brooklyn has utilized pregame fruit smoothies for an extra advantage. During previous crunchtime explosions, Russell has famously pointed to his forearm, claiming he has ice water flowing in his veins. And while there is no scientific proof that below-freezing liquid in fact occupies Russell’s bloodstream, the Nets and their burgeoning star point guard are pushing to return to the postseason for the first time since 2015, fueled by… pregame fruit smoothies. “We wouldn’t drink it if it don’t help,” says rookie forward Dzanan Musa. Cynthia Sass consults the Nets and New York Yankees in sports nutrition, holding master's degrees in both nutrition science and public health. Sass’s smoothies are customizable for each player, catering to their tastes and different supplemental values. “They try to help us be… flavorly, but to feel good,” says swingman Treveon Graham. The vast majority of players prefer a strawberry and banana base, but the remaining contents can vary drastically, from optional pre workout, protein powder, yogurt and other nutrients. “It gets everybody going before the game, gets everybody loose,” Graham says. Musa, the 19-year-old Bosnian, had never paid much attention to his precursory beverages while playing overseas. “I drank Coca-Colas before games,” he says, sheepishly. “When I came it all changed.” While the rookie has played sparingly throughout his inaugural season, he has felt a difference in his performance during G-League appearances following his preferred peanut butter, protein, strawberry-banana smoothie, most notably in power and stamina. “The shake is to get you the right stuff that you need but yet still feel like you can go out there and play at your game speed,” Dudley says. The 11-year pro only opts for a smoothie when he is particularly hungry. 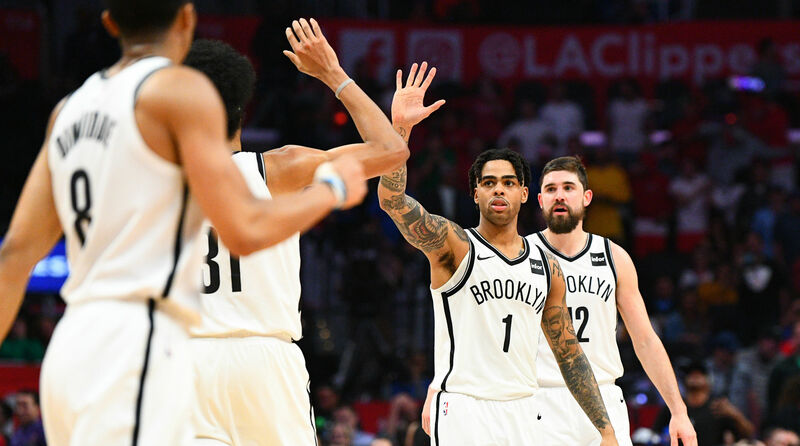 Brooklyn typically holds its teamwide pregame meals a bit earlier on the road, leaving Dudley in search of his strawberry-banana mix more often when the Nets play away from Barclays Center. Raspberry is the next most-common fruit included in the smoothies, according to several players. Yet not every Net partakes in Brooklyn’s fruity pregame ritual. Reserve guard Shabazz Napier chooses to handle the majority of his preparatory eating on his own. “I make stuff at home,” he explains. Napier will usually consume snacks loaded with peanut butter and carbs. He’ll blend his own shakes, but consisting of vegetables as opposed to fruit. “Got to get my green intake,” Napier says. He does keep a bag of Protein Balls the Nets provide to their players in his locker, along with his own sports drink mixology station. Ever since he caught food poisoning in high school, Napier has followed a doctor’s suggestion of watering down Gatorade to his perfect balance. “I’m not a sweet guy, fam,” he says. When pressed for further detail on what ingredients qualify as “abnormal stuff,” Dinwiddie emphatically shakes his head. “Sometime the secret is that little bit of difference between me and the next guy.” In a cramped postseason battle where just five games separate the 6-seeded Pistons and 10th place Hornets, the No. 7 Nets will take any marginal advantage they can.